Now THIS is an update! 3:55pm EST - The update and devblog are live! 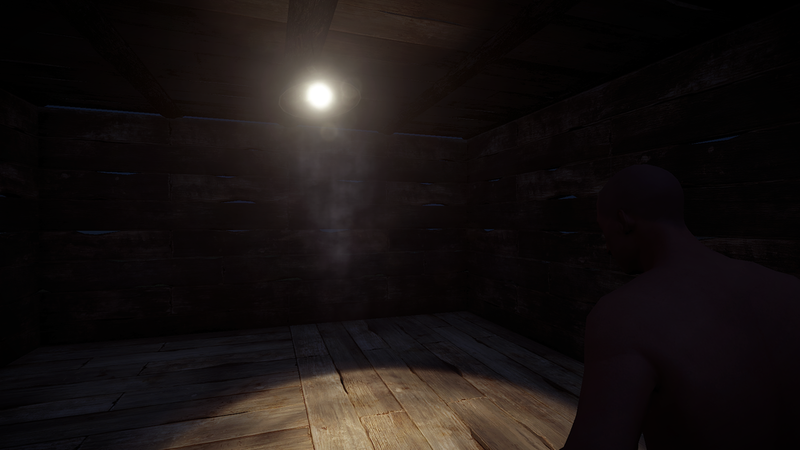 1:34pm EST - Helk just changed to cost of the new ceiling light from 4 high quality metal to 200 metal frags (and still 30 low grade fuel). Wall frame can no longer be placed after roof (fix for RUST-689). Lanterns can now be placed on boxes (and they look a bit nicer, too). Improvements to the new ceiling lights (mainly for performance). 1:00am EST - Our favorite time of the week is here - update day - and we've got a great one! There were a ton of changes to armor and damage calculations this week along with a much needed exploit fix for DirectX 9. On top of this, there’s been forward movement on some of the more long term projects (XP system, procgen, character models, etc.). Oh, and swinging ceiling lights! This update will not force a wipe game wide (expect that next week). As always, some servers will choose to wipe anyway (including all Rustafied servers except low pop). Our update stream will return today at 3pm EST. Follow @Rustafied for info throughout the day. Roadsign armor is more effective against melee, less effective against bullets. Wood armor very effective at stopping shots, but breaks after being hit twice. Helmets are overall more effective against melee, but easier to break. Metal facemask / chestplate slightly cheaper, but only save 5-8 shots before requiring repair. Bone armor nerfed against bullets slightly. The way damage is calculated has shifted this week. If you’re in to looking at numbers, here is a before and after of the damage multiplier for each body part. Long and short, hits to the arms now yield 50% damage instead of 100%. This is aimed at making armor more viable because if you wore full metal before and someone shot your arm in front of your chest, it would do 100% damage instead of the 30% that armor would have provided. So now, shots to the arms always do 50%. In addition to this, melee weapons now look for the best body part to deal damage to rather than just taking the first one they can find. This means if you swing at someone's chest and a hand gets in the way, the strike now registers as a hit to the chest, not the hand. But, if you hit just the hand, it’ll do 50% damage. Make sense? Cool. An important note to you PvPers out there, syringes have been nerfed this week. They now only heal 5 health instantly then gradually heal an additional 30 over time (at a rate of about 1hp per second). You’ll also note this is 5hp less than the previous healing power. A huge bug has been in play which had various map elements like bushes not render if you ran the game in DirectX 9 mode. Thankfully, this has been resolved. Taylor has been working on some improvements to the player models, with a focus on cleaning up those pesky seams. Although some progress has been made, these changes have not yet been merged into main, so we might have to wait another week before we’re sans seams. Andre has continued his work on the next iteration of the procedural map generation due out next week. No new visuals yet as it’s on a separate branch - expect more details from Andre in the devblog. As mentioned in last week’s devblog, it’s not looking like the XP system will make it in by next week. Therefore, we’re probably looking at a May 3rd launch of this new system at the earliest. Stay tuned for more details as this system progresses. perf 4 in console now shows ping next to fps. In an effort to raise funds for a new dedicated box, we’ve started selling VIP slots for our medium and low pop servers. These allow you to skip the queue and get into the server even when it’s full. I’m happy to report we’ve almost hit our goal and expect to have the new box in the next couple weeks. Also, at the request of several people, we’ll soon start selling VIP slots for our other servers as well, so stay tuned.